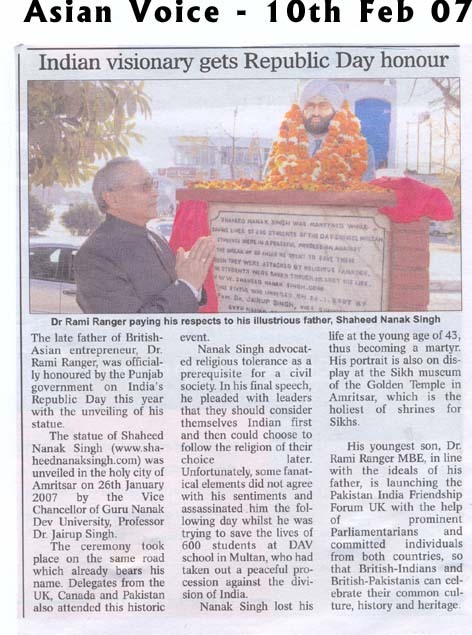 The Punjab Government unveils the statue of Shaheed Nanak Singh, a committed patriot and visionary who stood for India’s unity on India’s Republic Day, the 26th January 2007 in the holy city of Amritsar by the Vice Chancellor Professor Dr. Jairup Singh of the Guru Nanak Dev University. The ceremony took place on the road which already bears his name. 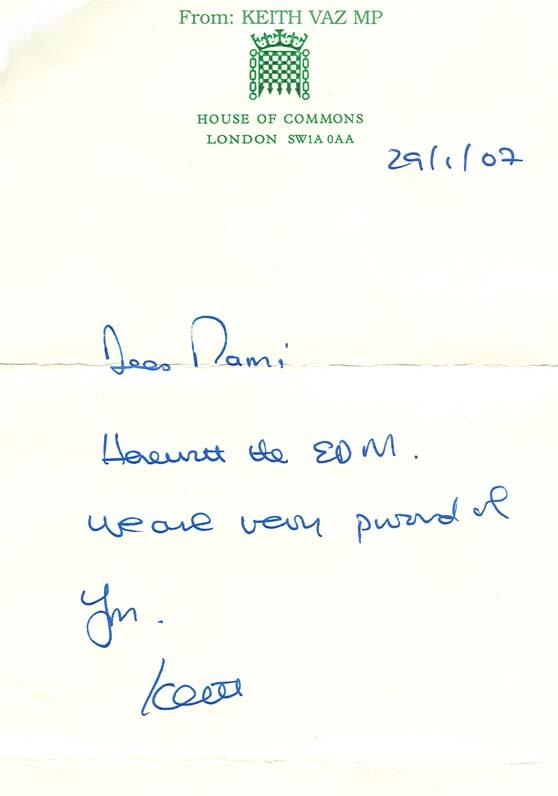 Delegates from the UK, Canada and Pakistan also attended this historic event. 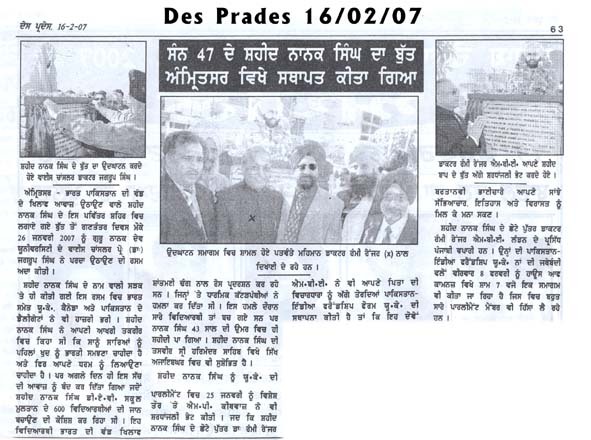 Shaheed Nanak Singh advocated religious tolerance as a pre-requisite for a civil society. He made his final speech and pleaded with all the leaders that they should consider themselves Indian first and then could choose to follow the religion of their choice later. 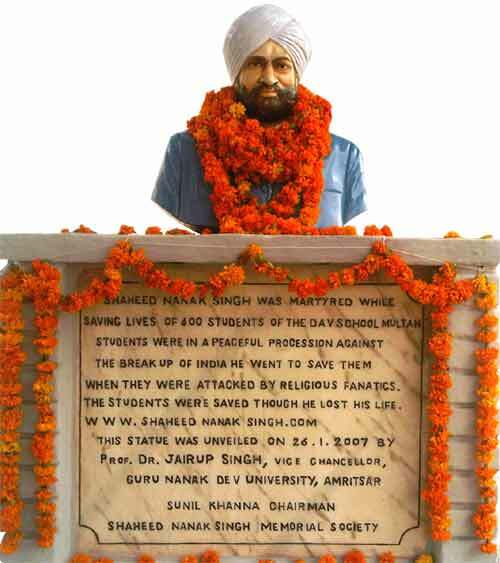 Unfortunately, the fanatics could not appreciate the “truth” of his words and assassinated him the following day when he was trying to save the lives of 600 students of DAV school, Multan who had taken out a peaceful procession against the division of India . 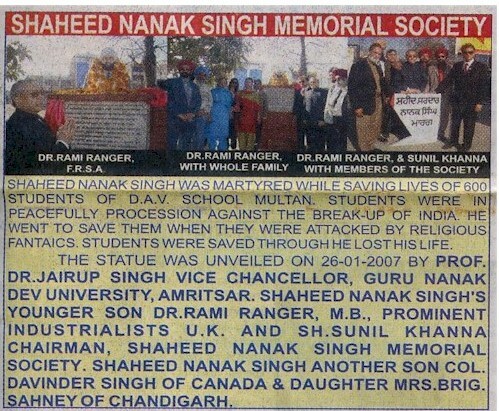 The students came under attack from the religious fanatics and Nanak Singh went to save them. They were saved but he lost his life and became a martyr at the young age of 43. 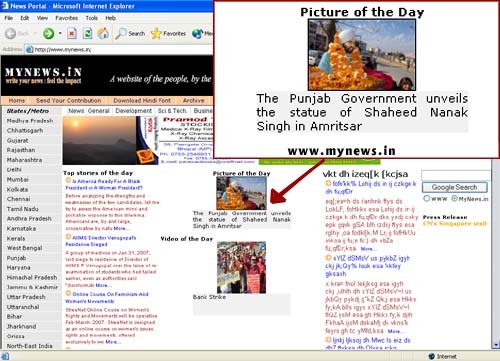 His portrait also is on display at the Sikh museum of the Golden Temple , Amritsar which is the holiest shrine of the Sikhs. His ideals are more important now than ever before if we are to avoid the experiences in the world like Ireland , Lebanon and of course India and Pakistan . The Rt. Hon. 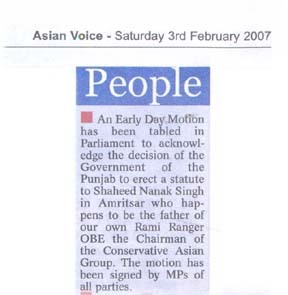 Keith Vaz MP made an early day motion on the 25th January 2007 to this effect in the British House of Commons to salute the sacrifice of Shaheed Nanak Singh a great son of India. 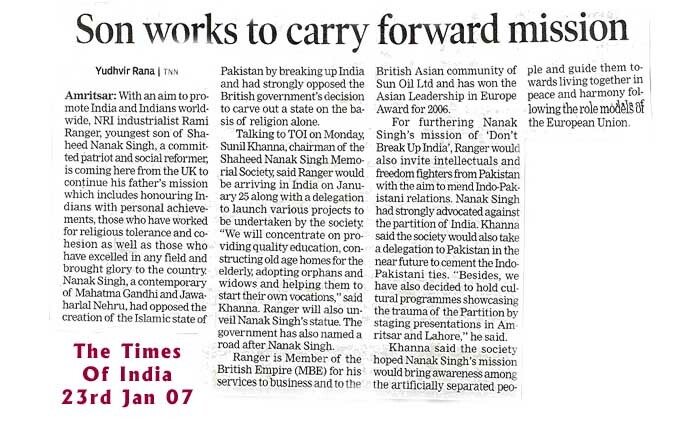 His youngest son, Dr. Rami Ranger MBE in line with the ideals of his father is launching the Pakistan India Friendship Forum UK with the help of prominent Parliamentarians and committed individuals from both countries concerned so that these two British communities can celebrate their common culture, history and heritage. India and Pakistan are two sovereign nations and there is no reason why they should not follow the example of Britain and Germany and work for the uplift of their people by promoting peace. Please see pictures below. 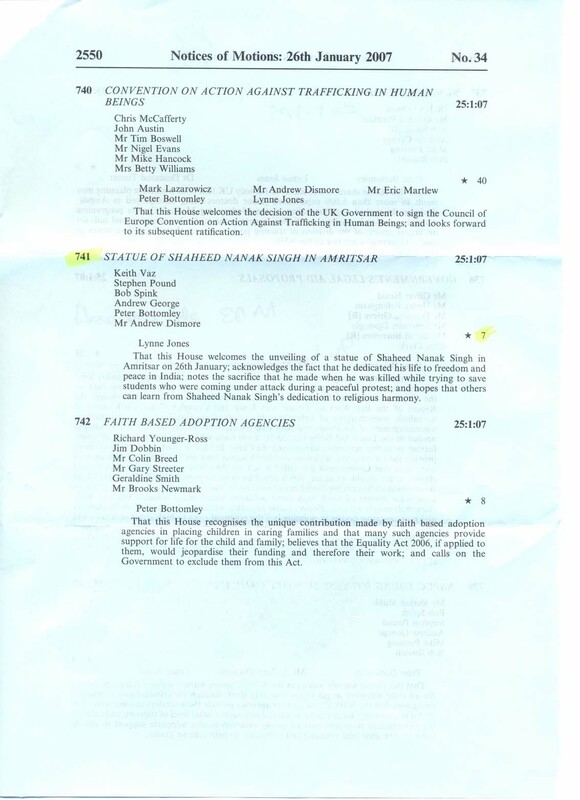 Please click on picture to enlarge.